Instead of our usual Crazy Crafters Team Project Highlight, the amazing Kylie Bertucci is running an international project highlight this week with the theme: Love. Many very talented people are taking part, so it's well worth the visit here. From 6.30pm AEST on 8 April, for a week, you'll also be able to vote for your favourite projects. Keep your eye on the lower right square! It just so happens that my wonderful husband has earned LOTS of brownie points recently, so I decided to make a special card for him. You may be asking, "What did he do that was so special?" He has made it possible for me to travel back to England to attend the memorial service of someone special to me and also to visit friends and relatives that I haven't seen for a while - something I hadn't thought I would be able to do and that will mean so much to me. He's not only an amazing husband but also a wonderful human being and it's nice to be able to celebrate that. It seemed appropriate to use the Traveler stamp set and I've made a Peak A Boo card. If you look carefully at the world map in the bottom right corner of the card, you may be able to see that I've highlighted England and drawn a rough route from Sydney to London! As you open the card, the map is replaced by some mushy but heartfelt words! 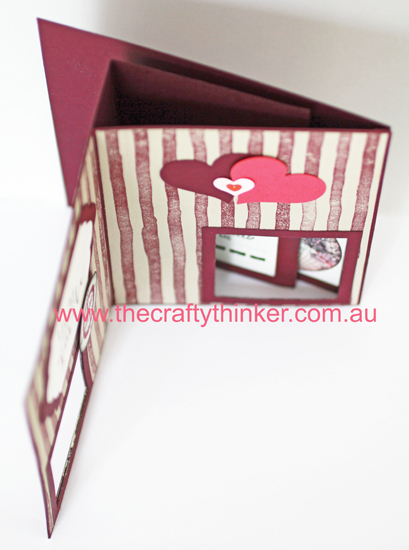 To make the card base I used the video tutorial by Norma Lee at Splitcoaststampers but made a couple of adjustments. 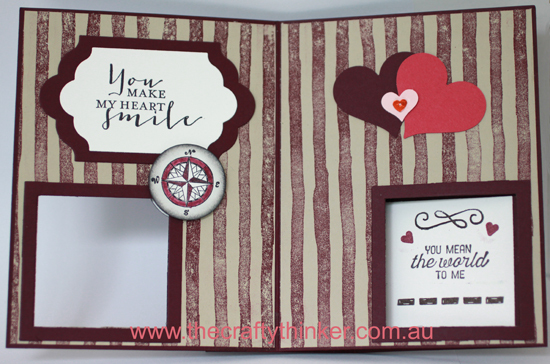 I used the Brushstrokes background stamp to make the striped background with Blackberry Bliss ink on Sahara Sand cardstock. 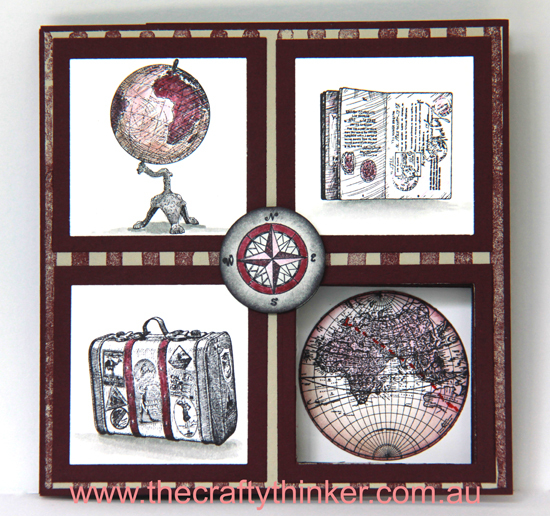 I stamped images from Traveler and The Open Sea in Basic Black onto Whisper White cardstock, watercoloured them and cut them out with one of the dies from the Squares Collection Framelits. The Peak A Boo greeting is from the Going Global set and I added decorations from That Thing You Did and a couple of hearts using a tiny little stamp in the First Sight set. The other greeting is from Timeless Love. After stamping the greeting in Basic Black onto Whisper White card, I cut it out with one of the Lots of Labels framelits and used the next size up framelit to cut a mat for it from Blackberry Bliss cardstock. I used the Sweetheart punch to cut hearts from Blackberry Bliss and Rose Red cardstock and added a smaller Pink Pirouette heart cut with one of the Itty Bitty Accents punches. I added a heart-shaped sequin from the Brights Sequin Assortment. Once the card is fully open, it looks like this. I stamped the compass from The Open Sea twice in Basic Black ink onto Whisper White card and punched them out using the 1.25" circle punch. Then I sponged them with Smoky Slate, followed by a little Basic Gray and finally just a hint of Basic Black on the edge. I watercoloured them in parts with Rich Razzleberry ink and then adhered them with Dimensionals. 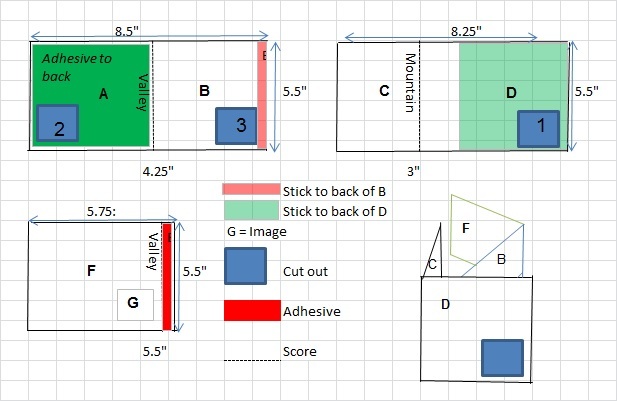 I cut two pieces of Blackberry Bliss cardstock to 5.5" x 8.5"
One of these I scored in half at 4.25"
The other piece, I scored at 5.5"
I positioned the square die (with the blade up against the edge of the folded over card, just as Norma does) in the lower right quadrant. Then I followed the same method as Norma to line up and cut windows in the remaining layers. I made three frames from Blackberry Bliss card and glued them into position. I cut the three Blackberry Bliss mats for the front of the card using the larger of the dies I had used to create the frames. I cut a piece of Blackberry Bliss cardstock to 5.5" x 5.75" and scored at 5.5" and adhered it to the back of the card (just like Norma). The finished card is 5.5" square.